I’m very proud of my son and associate, Ty Supancic, Esquire. Ty has an Estate Planning practice, which includes Wills, Trusts, Asset Protection, and Gun Trusts. He also practices in all areas of Family Law with an emphasis on Mediation, and he continues to represent Artists from his days in the Entertainment Industry. All personal relationships, from casual dating all the way through marriage and the relationships we have with our children, are governed by the law. Unless you’re a hermit, at some point the law will intersect with your personal relationships. Join us on Tuesday, November 15 at 6:30 p.m. for a discussion designed to cover some areas which will be of concern to everybody attending, even those with perfect marriages and perfect children. 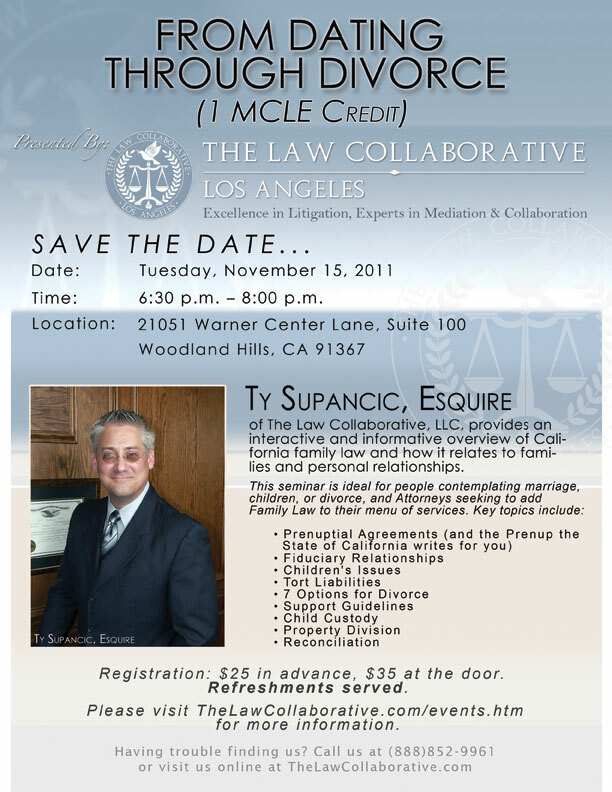 Attorney Ty Supancic will discuss how California’s 2000 page prenuptial agreement (aka the California Family Code) can be overcome with some advance planning by dating couples, designed to strengthen relationships before marriage so that the resulting marriage has a better chance of enduring. Ty will present and discuss communication tools developed by mental health professionals to enhance relationships before, during, and after marriage. Powerful tools we can bring to bear in all of our relationships. Even in the best marriage, the law is ever present. Ty will discuss and explain responsibilities couples have to each other, parents have to children, and parents have to the world. This includes child labor law, dealing with troubled children, and planning for your children’s retirement. If you know someone whose marriage has fallen on hard times, Ty will discuss tools that can help save a marriage, or if it can’t be saved, may help the parties have the least destructive family reorganization possible with the fewest casualties and at the lowest cost. Not only is divorce second only in stress to the death of a loved one, but it often results in financial disaster. It doesn’t have to be that way. Ty will discuss the seven options couples have if they decide their marriage cannot be saved. The options include creative solutions not considered by any court, which can minimize impact to children and the couple’s finances. Ty will also discuss the process of dissolution in California. What procedures are required, what pitfalls and dangers might be encountered and how to avert them, and what measures can be taken to minimize the long-term impact. He’ll also discuss relationships after a final divorce decree. The Law Collaborative takes a holistic view of family law: We realize that divorce isn’t the end. Relationships continue in one form or another, especially if there are children. Without this insight and without proper acknowledgment of this truth and careful planning, a divorce can destroy lives in the long term — solving nothing but creating many new problems. Ty Supancic is an attorney with a perfect marriage and a perfect child, but that wasn’t always the case. Ty also has a decent sense of humor and will try to utilize it during this discussion. Questions are welcome, refreshments and handouts will be provided. Save the Date for From Dating Through Divorce, an interactive presentation by attorney Ty Supancic of The Law Collaborative. Anyone contemplating marriage, children, or divorce, and those seeking a general overview of how the law relates to families, are invited to attend. Licensed attorneys who attend will earn 1 MCLE Credit. For more information or to register today, please call us toll free at (888) 852-9961 or visit www.thelawcollaborative.com/events.htm. Woodland Hills, CA – August 30, 2011 – Ty Supancic, Esq. today announced that The Law Collaborative, LLC, which recently re-located to Warner Center, has become a member of WealthCounsel®, a nationwide organization of more than 2,200 estate planning attorneys. Members of WealthCounsel® believe in a comprehensive, client-centered approach to estate planning founded on the principles of professional collaboration and a commitment to excellence. “Estate planning is an ongoing process and not merely a single legal transaction,” said Supancic. “As a member of WealthCounsel®, my firm will have access to a state-of-the-art document drafting system, a network of experienced colleagues throughout the country with whom I can collaborate, and educational resources to keep me on the cutting edge of knowledge.” Supancic stated. Supancic noted that the majority of Americans do not have a simple will, let alone an estate plan. 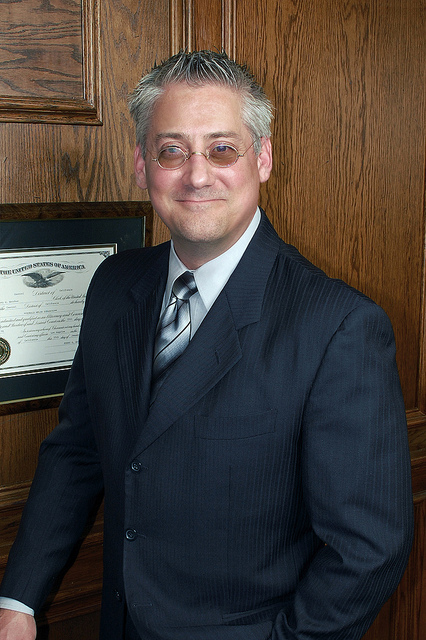 He stated that he has witnessed many situations where the lack of an estate plan has created unnecessary familial chaos for the client’s beneficiaries so he is particularly passionate about building awareness of the importance of thoughtful planning which includes planning for the care of children and the disposition of new technology assets previously ignored by traditional attorneys. In addition to WealthCounsel®, Supancic is also a member of the California and Beverly Hills Bar Associations, and is admitted to practice law before the Central District Court. Established in 2009, with over 100 years of combined legal experience, The Law Collaborative, LLC specializes in all areas of estate planning, including asset protection, charitable planning, and business succession planning. They also specialize in all aspects of family law and entertainment law. 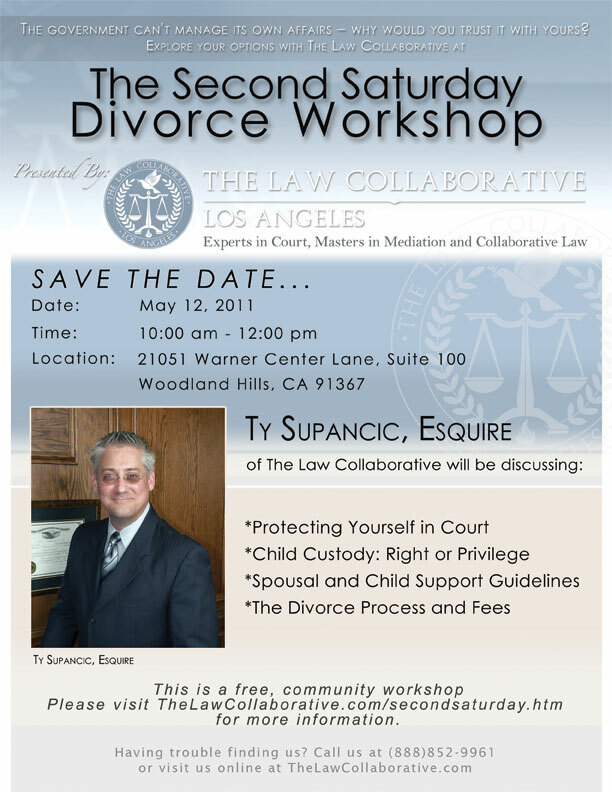 For more information, please visit www.thelawcollaborative.com/ or call (888) 852-9961. These may all seem like trifling details, but as several wiser than we have observed, “God is in the details.” Details are things we can easily control and change. By changing our language to reflect our goals, and by changing our office culture from hierarchical to heterarchical, we hope to fundamentally change the way we think when we walk into our office. When we’re sitting at our desks, we want Collaboration to be our first nature. When the phone rings, we hope to already be in a cooperative, collaborative mindset. When a client starts sharing their conflict with us, we want our minds to search automatically for creative collaborative solutions. If we labor hard to be collaborative all of the time, we won’t have to labor so hard to be collaborative when our clients are depending on it. This is why we collaborate. Be changing these and other details of our work life, we hope to change our thinking. By changing our thinking, we hope to change our practice. By changing our practice, we hope to change our system, and eventually our culture. The most ambitious journey starts with the smallest steps. One of our goals is to instill in our clients those skills they will need to navigate future controversy and conflict without allowing it to escalate to the level of litigation. We must teach our clients that oftentimes the best solution is not one of the choices presented. Often, the best solution is something neither side can see nor has considered. When you’re digging trenches and getting ready to exchange fire, you don’t always have time to step back and survey the landscape. In fact, any delay may result in your becoming a casualty of the conflict. “Strike first and furiously”. The traditional fight or flight attitude and belief system, so fundamental to zealous advocacy, are anathema to effective CDR. Parties truly interested and committed to finding a low-cost, low-impact solution to their conflict can find their process instantly and irrevocably derailed by the argumentative fighting instinct honed by their attorney after years of argument and litigation. It is so important that we nurture, foster, and maintain the collaborative mindset that we must even change our language. In our Collaborative cases, there are no “opposing party” or “opposing counsel.” Not even in our notes. We labor to use the terms Collaborative Counsel (abbreviated “Cola” in our notes) and we try to use the parties’ first names at all times. We want our notes and our letters and our files to reflect this radical new way of thinking. Collaboration does not yet make up the majority of our case load so our other files use traditional terms, but as soon as we open a Collaborative file, the language we’ve used should help to place us in the right mindset – the only mindset that supports the scope of representation for which we were retained in a Collaborative case. Likewise, we labor to use neutral terms and first names in our mediation cases. We labor to insure that our correspondence and notes are neutral on their face. All correspondence is addressed to both parties in mediation. We alternate parties in the greetings from letter to letter and we even alternate the return addresses at the top of the page. Typically, if wife’s address appears on the left and husband’s on the right, or wife’s on top and husband’s underneath, we reverse the greeting so the party “billed” first is greeted second. In our next letter, both are reversed. We believe that in order to excel as masters of collaborative methods and techniques, we must apply them as often as possible. Given that the vast majority of our waking time is spent at work, work is the best place to develop and exercise these new skills. To that end, we have a unique management structure at TLC. The vast majority of law firms and businesses in general are ruled by a hierarchical system; managing partners supervising partners, supervising associates, etc. The classic “top down management” system. At TLC we practice a heterarchical system of management. That is, we collaborate in office management decisions and day-to-day operations. At TLC we have group meetings where we attempt to solve problems and make decisions collaboratively. Rather than one person dictating the color of the paper for a particular form , we try to choose the color collaboratively. Rather than just the partners or a committee writing the mission statement, firm values, and the procedures manual, the whole staff painstakingly collaborated on everything. One thing we’ve learned is that a decision which one person can make in an instant, may take hours to make collaboratively. Collaboration is not the quickest method of problem solving. If measuring only time, it is not at all efficient. But if the desired outcome is one with profound long-term impact, it is the most effective method. The time we spend collaborating on internal office issues is an investment in developing collaborative skills and instincts. They say that when all you have is a hammer, every problem looks like a nail. Collaborating with your co-workers all day is like standing in front of a great tool chest with all the drawers open. If we are to become masters of this new technology, this technology so foreign to professionals trained and indoctrinated in adversarial and positional dispute resolution, it must become our second nature. No, it must become our first nature. Sensitive matters may not withstand a non-collaborative or aggressive response to a problem. Since either party can unilaterally withdraw from the Collaborative process and disqualify both attorneys from further representation, each response to conflict must originate from the right mindset. If an attorney is sitting at her desk, making unilateral decisions, dictating procedure, making hierarchical demands, she is not in the right mindset to deal with a call from her client or opposing counsel on a Collaborative case. It is too easy to fall back into habits which do not foster or support collaboration. We can easily take a case sideways with just a few words coming from the wrong mindset. How can we expect our clients and opposing counsel to “collaborate” when the stakes are high if we can’t collaborate in the low-stakes day-to-day operation of our office? We have seen Collaborative Law cases, where well-intentioned parties have made significant progress, unravel due to “good” traditional lawyering. In order to negotiate the minefield of conflict, one must proceed with caution at all times. Instinct and gut reactions are important, but they must originate in a place of commitment to the goals expressed by the parties. An attorney who is representing a party in a CDR case must remember that the scope of their representation requires that they adhere to good CDR protocols. Ignoring that fact ignores the scope of representation and violates the rules of professional conduct. We’ve heard opposition to this approach; “What about your litigated cases, won’t they suffer? Won’t you lose your edge?” No, old instincts are hard to kill. Trying to think collaboratively all the time does nothing to dull our deep inbred fight or flight instinct. In traditional litigation, each side in court must take a position, usually in opposition to the other side. In theory, the “trier of fact” is wiser than his litigants, and only after an intelligent and thoughtful review each side’s position, can the judge administer “justice”. We all know that true justice is rarely the result. Judges are never as familiar as the parties are when it comes to the intricacies of their circumstances. Sometimes the judge may not even understand the underlying law. The resulting “justice” is sometimes really just a partially informed third party’s opinion. In Collaboration, solutions are not dictated to the parties, but arrived at by the parties themselves. The parties are not made to take positions, but are asked about goals and outcomes. Negotiating from the outcome rather than the position allows for creative problem solving. Oftentimes creative solutions present themselves where no solution seemed possible. Rather than the litigation model’s “winner take all” result, Collaboration can result in a true win/win solution. Furthermore, since the parties play an active role in the problem solving process, they are usually much more satisfied with the results even if they might not have been otherwise. The parties are able to “own” the results since they controlled the process. In order to be most effective, collaboration should really be an end unto itself. Many controversies and conflicts are ongoing issues with ever-changing and evolving facts and situations (e.g. child custody, support, or disability). As long as parties remain in relationship (father/mother, employer/employee) the potential for controversy and conflict is never ending. Ongoing controversies cannot be efficiently addressed by occasional saber rattling letters and threats of litigation. These only polarize the parties and may serve as a kind of “dare” to litigation. On the other hand, a continuing and constant application of Collaborative methods can prevent controversies from becoming conflicts. In our experience, Collaboration has proven to be the most cost effective and least destructive method of long term dispute prevention and resolution. This page took 0.505 seconds of computer labor to produce.